Serious discussions of the relationships between message, audience and graphic design are still handicapped by a limited lexicon. Yet our need for an enriched language is greater than ever. The youthful status of graphic design, with its relentless desire to move forward – seeking new relationships and definitions of its own identity – has prevented a meaningful consolidation of its position. One result of this ‘driving forward’ has been the adoption of new languages from outside the discipline. This process, rather than describing the genuine integration of new ways of thinking, has tended to overlook the basic problem of how to develop a generic commentary for graphic design itself. The need to describe the complexity of design and its role as a communicator of ideas and messages is long overdue – and has enormous significance both for designers and for the wider audience outside the discipline. Graphic design or visual communication is an inherently reflective process, exploring the relationship between the message / product and its audience. Reacting to popular cultural and technological developments, while reflecting on its own activity, it is constantly involved in a re-invention of its self-image. Moves to explore a more academic discussion of the relationship between message, audience and graphic design as an important component of a wider cultural debate have been handicapped by the limited lexicon the discipline uses. The language of design is often too technically specific, too business-oriented or plainly just not sophisticated enough to describe the richness and complexity of graphic design’s involvement in the activity of communication and creativity. This language, which has been described as ‘the garb of a discipline ( … ) the specialised “speak” that shields it from the lazy probing of ordinary people’,  suggests an attitude and a conflict which is not peculiar to graphic design, but one that indicates the difficulty in ‘growing’ internal and external discussions of the subject. 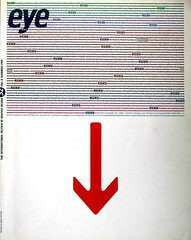 Writers and designers have explored the possibility of applying theoretical models from outside the discipline – for example from language theory, philosophy and cultural studies – and some of the associated language has been subsumed into the commonplace description of the process of graphic design. Building on the work undertaken by educators in design schools within universities, where a broader, more theoretically grounded approach has been investigated, the profession has incorporated terms and descriptions from other disciplines as a common factor in its 'reflective' development. Whether that would suggest a wholesale understanding of the ideas and concepts behind that language, and their genuine integration into a new discourse, is open to debate. For some time designers (Weingart, Frutiger and Kinross for instance) have argued for broader discussions within the profession, based on the understanding of language and semiology, including such subjects as semantics and structuralism, but with little or no real effect to date. The attempt to extend the scope of graphic design by integrating theoretical models from other disciplines has been a necessary and vital development in its recent history, and will continue to be so. It is consequently difficult to understand why both designers and design educators have largely ignored the opportunities presented by a closer examination of the grammar – and by extension the thinking and working methodologies – of the activities that are obviously allied to the practice of graphic design. In order to describe what already exists within an extended practice, graphic design should consider the discourse in neighbouring disciplines with a longer history of self-analysis and critical development. The challenges facing the profession will be better met once its practitioners have undergone an exercise in defining their position and terms of reference. With the application of analytical models (and the ensuing language) from close neighbours, the developing interest in cross-disciplinary activity and the breaking down of boundaries between traditional specialisms is greatly increased. A process of evaluation and reflection has begun, exemplified recently by the many publications relating to the subject, but it is not yet founded on the solid base of a rationalised vocabulary specific to the discipline, and a critical discourse accessible to a wider audience. When we understand this, it is no longer a mystery that a subject so ubiquitous, influential and persuasive could remain such a well-kept secret for so long. Graphic design is consumed more frequently than television or film, is as significant and intrusive as advertising (of which it is an integral component) and has a history which is part of the development of twentieth-century culture. Yet where the subject is presented in a popular context, as at the recent ‘Power of the Poster’ exhibition at the Victoria & Albert Museum in London (Eye no. 28 vol. 7) it is half-hidden beneath an overarching banner of advertising, and portrayed as a working method along the lines of printing or copywriting. The profession needs to increase the awareness of visual communication by the general audience – the consumers of what it produces – and enable them to participate in the discussion. This would require a meta-language that is accessible to all. Another difficulty in realising the potential of graphic design lies in the reactive nature of the discipline and its practitioners. It would be hard to pinpoint the occasions where visual design has been genuinely innovative in a broad cultural sense. Historically, it is easier to point to key developments as reactions to new technologies such as lithography, metal type, photocomposition and, more recently, the Apple Macintosh. How much of the internal perception of design as innovation is influenced by the newness and language of the technical envelope of the day? This schism between the theorists of graphic design and its practitioners may prove to be a stumbling block in the development and awareness of the profession, but it could be avoided by the creation of a common dialect central to the understanding of the field. This language will need to be developed from both theoretical concerns intrinsic to the discipline, and through reflective practice. The separation that currently exists between a discourse borrowed half-heartedly from art history, language or cultural theory and the pragmatic descriptions of a manufacturing industry must be addressed if the profession is to develop. An examination of the critical vocabulary of distinct but allied disciplines would offer graphic designers a model on which to build, while a wider interpretation of design as a cultural force would provide an ideological perspective by which to understand it. 1. Ludwig Wittgenstein, Tractatus Logico-philosophicus, proposition 5.6. 2. Edward McDonald, ‘The Education of Young Design’, Eye no. 12 vol. 3, 1994. 3. John Warwicker / Teal Triggs, ‘inthisworldtogether’, Emigre no. 40, 1996. 4. Gunnar Swanson, ‘Graphic Design Education as a Liberal Art: Design and Knowledge in the University and the Real World’, Design Issues vol. 10 no. 1, Spring 1994. 5. J. Abbott Miller, ‘What did you do in the design studio, Daddy?’, Eye no. 22 vol. 6, 1996. 6. Nico Macdonald & Kevin McCullagh, ‘Power from the Past’, Design Review no. 13, 1994.